Wine and Dine during your stay at the fantastic RH Restaurant. Eat. Drink. Stay. Our Treat. Enjoy a $100 food and beverage credit towards any food and beverage purchase in all hotel outlets and an upgrade to the next room category. Plus relax a little longer and enjoy a 2 pm late checkout. $100 f&b credit is per stay and one room category upgrade excludes suites. Offer valid for credit per stay that can be applied against $100 food and beverage credit. 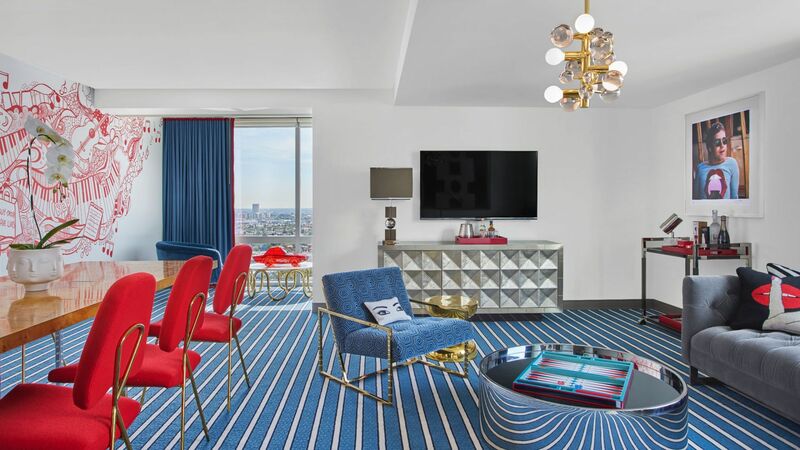 Offer valid for reservations made in advance between 04/09/2019 and 01/24/2020 for stays from 04/09/2019 through 01/31/2020 at Andaz West Hollywood. Must request offer code EAT100 or FBE100 or 100EAZ at time of booking to qualify. Credits must coincide with guest’s stay at Andaz West Hollywood. All guests must be at least 21 years of age and/or of legal age to consume alcohol in the jurisdiction where the hotel is located to receive alcoholic beverages. No credits may be used towards alcoholic beverages. A limited number of rooms are allocated to this offer; reservations subject to availability. Offer not valid with groups, conventions, other promotional offers, tour packages or special rate programs. Rate is per room, per night, based on double occupancy and excludes service charges, mandatory resort fees, applicable taxes and other incidental expenses. Additional charges may apply for additional guests or room type upgrades. Guest is responsible for all charges not included in package. No refunds for any unused portion of package. No substitutions nor replacement services or products offered for package inclusions. A portion of the rate for this offer may reflect taxes, service charges, gratuities, and third-party charges for certain included items, and those costs are not eligible for World of Hyatt® points. Bed and Breakfast Offer valid at participating hotels. Reservations are subject to availability and must be made in advance. Package includes Daily Breakfast for two. Rate shown is per room, per night, based on double occupancy; standard room accommodations. Additional charges apply to room-type upgrades. Additional guests may be subject to additional hotel charges. Guest is responsible for all charges not included in package. No refunds for any unused portion of package. A portion of the rate for this offer may reflect taxes, service charges, gratuities, and third-party charges for certain included items, and those costs are not eligible for Hyatt Gold Passport® points. A limited number of rooms are allocated to this promotion. Promotional blackout periods may apply due to seasonal periods or special events, and normal arrival/departure restrictions apply. Hyatt reserves the right to alter or withdraw this program at any time without notice. Hyatt Hotels & Resorts® encompasses hotels managed, franchised or leased by subsidiaries and affiliates of Hyatt Hotels Corporation. The trademarks Hyatt®, Hyatt Hotels & Resorts®, Park Hyatt®, Andaz®, Grand Hyatt®, Hyatt Regency®, Hyatt Place®, Hyatt House®, Hyatt Zilara™, Hyatt Ziva™, Hyatt Gold Passport®, and related marks are trademarks of Hyatt Corporation. © 2016 Hyatt Corporation. All rights reserved.